with bath tub and shower fix , wc, and window. Independent heating, TV, wm, no phone, no elevator, balcony. Monthly possible. Le logement de Chiara est immense, très lumineux et très agréable, dans un quartier vivant mais au fond d'une rue calme et pittoresque. Parfait pour profiter du magnifique quartier de Trastevere sans en subir les inconvénients du bruit ou de la foule. Un excellent rapport qualité/prix, et un très bon contact avec le propriétaire, réactif et disponible. Grazie Guglielmo! Sauber, geräumig, gute Lage. Wer die 75 (sic!) Stufen nicht scheut, wird sich hier sehr wohl fühlen. Freundlicher Empfank durch Adriano. Einziger Kritikpunkt: Ein Duschvorhang wäre sehr nützlich. L'appartement est grand, lumineux et calme dans un endroit prilivégié de Trastevere. Il est regrettable qu'il manque de soins, surtout au prix où il est proposé (130€/jour est le prix d'une chambre dans un bon hôtel 3 étoiles du centre de Rome). Internet ne marchait pas - la propriétaire aurait oublié de payer l'abonnement! - or nous avions choisi la formule location d'appartement pour pouvoir un peu travailler sur place. Une partie du mobilier est vétuste, les installations de cuisine sont minimales, une poussière de quelques semaines recouvrait le sol. Ya tenemos confirmacion de vuelo para mañana. The perfect spot to visit the Eternal City, ideally located in the Trastevere, with the romantic and peaceful view on the botanical garden. Rented this apartment for many years and always the same particular spirit, few steps from the Farnesina, Palazzo Corsini and the authentic Rome. The apartment itself has been recently renovated and nicely furnished, a fully equiped kitchen to prepare the pasta and welcoming large and bright living for the aperitivo ! definitively a second home in Rome ! The apartment was perfect for us. We loved the area, the rooms were well-furnished and, except for a glitch with the dishwasher, all of the appliances worked well. We highly recommend this apartment. Owner Comments: Hello. Im happy you had a pleasant stay. 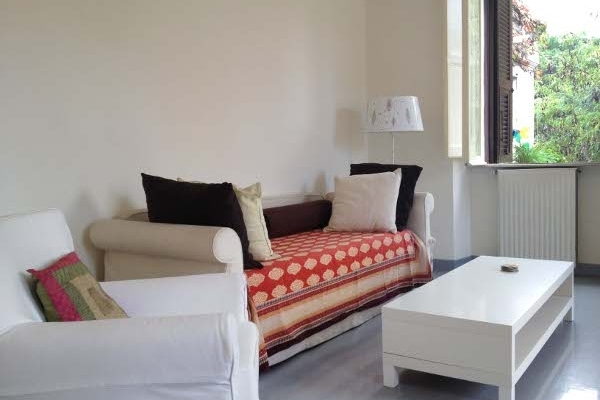 We had just updated and refreshed the apartement and feel it now can truly be a zen experience close to all of the activity of Trastevere and the center of Rome. The apartment really has the potential to be classed excellent - fabulous location, airy, quiet, etc. Unfortunately, it was quite dirty when we arrived - I had to wash out the bathtub and scrub the toilet seat, and the small balcony was so covered with junk, bird crap and insects that we had to keep the door to it shut. Hot water heater also needs to be replaced. The people we dealt with at Roman Reference were all very friendly and helpful, but sadly the owner of the apartment evidently left it in a rather sad state. But once again, with one day of work they could turn it into a very nice apartment indeed. Owner Comments: The apartment has been renovated in 2012; balcony and windows redone, boiler replaced, new furniture added. It is now as enjoyable as it should be. Apartment was well located within walking distance of St. Peter's. The apartment had wonderful high cielings and the main room looked out over a park. Someone in the area keeps birds so we were all awake with the sunrise. Apartment is a little bare and therefore seems a little cold. Owner Comments: The birds are actually part of the botanical garden and this adds to the relaxing feeling of being in country side yet you couldn't be more central in Trastevere. Vatican City, Campo dei Fiori, Piazza Navona, all 10 minutes away. Very good location! The quality of the windows is very poor. The glass panels are loose and can fall out any moment! Unfortunately one of the little glass panels in the children's bedroom broke while closing the doors. The glass was loose so there wasn't anything we could do about it. Very comfortable,light, airy apartment. Extremely quiet -- we slept like logs! The location is perfect, on the edge of Trastevere, just by the river. Perfectly possible to walk everywhere in central Rome from the apartment and 20 minute walk to St. Peter's and the Vatican Museums. Lots of lovely little restaurants and grocery stores within minutes from the apartment. Loved it! We had so much fun while in Rome and staying in this apartment was a big part of it. We were close to everything yet the apartment was super quiet. There was so much green outside our window that it felt like we were in the country side. Loved the simplicity of the apartment which is mostly white and full of light. Hope to get to come back and stay here again.